I wanted to share a few blog/sites that I have found over the past several weeks that I love. These are sites that I have found recipes which I am hoping to try and that I have tried. I am really excited about some of these places. Don't you just LOVE the good ol' internet where you can find EVERYTHING it seems? From this site, I want to try: The Hot n Crispy Cauliflower Tader Tots! Oh, the delicious meal plan for the day -- I want to have ALL of these to eat! I think I just may! Bananas and almond butter - oh yum. And, I just love how she plated it. What a cute idea. The Cauliflower Crust Hot Pockets --- OH, YUM and so much better for you. So, as most of you know that I have been working through a process -- a DAILY, sometimes hourly process of getting myself to a state of better health... or maybe just being able to manage better the body I am currently given. Either way, I am on a journey. I am making slow changes... but changes regardless. It is a daily process. But, I have to PRESS ON and keep going. And, I have to PRESS IN.... lean into the God who delivers. Well, honestly I am doing "okay". It is HARD. I won't deny it. There are some REALLY good days and there a lot of HARD days. But, I know that there is reward at the end of the journey and God is teaching me a lot through it. I am thankful for those HARD days, because I know that it refines me and molds me... it helps me to lean in and trust the Creator God to be my Comforter when I am hurting. He is my PEACE when the storm seems to chase high on my tail. He is my STRENGTH when I feel I have nothing left in me. If at all, I am thankful that I know GOD who loves me deeply and cares about all the details of my days and moments. I have had several doctors appointments over the last several weeks or more. They have been encouraging. But, also a realization of what I need to do to take care of me. I feel like I am learning lots about health and what my body does or doesn't need. I am still working all of that out. I have not been the best at being disciplined in what I need to do. I give myself grace and move forward. I can' t dwell in my short comings, or else I become depressed and fall into those lies mentioned above and self pity and doubt. Not good. I am trying to go grain free. legume free. mostly dairy free. soy free. And anything processed is a big no for me right now too. My mom gave me a copy of this book. And, I have enjoyed it so far. I am still reading it and still sorting out what I am going to do as far as diet. So please pray for wisdom and discernment. I have to figure out what things to eat for myself and my body -- but, I also have to plan for my family, who eats for the most part differently (there are 2 vegetarians in my family). So, there is a challenge in itself, but I am working through it and finding creativity. So, I am asking for prayer. But, also I would love any sites or recipes that you love that might fit into my weird eating habits? Think Paleo/Primal/SCD/Grain-free etc. Also, I am good at adjusting recipes too. So, if there is an ingredient I can't have in there, I am sure I know of a substitute or alternative. Thanks friends! I appreciate you. You are wondering -- what is the plan? Right? I kind of left you hanging in my last post.... a cliffhanger ending. Well, almost. Ha ha ha. I need a plan. If I don't have a written out plan. I fail. I struggle. I cheat. I am scattered and don't make the best choices. So, I NEED a plan. 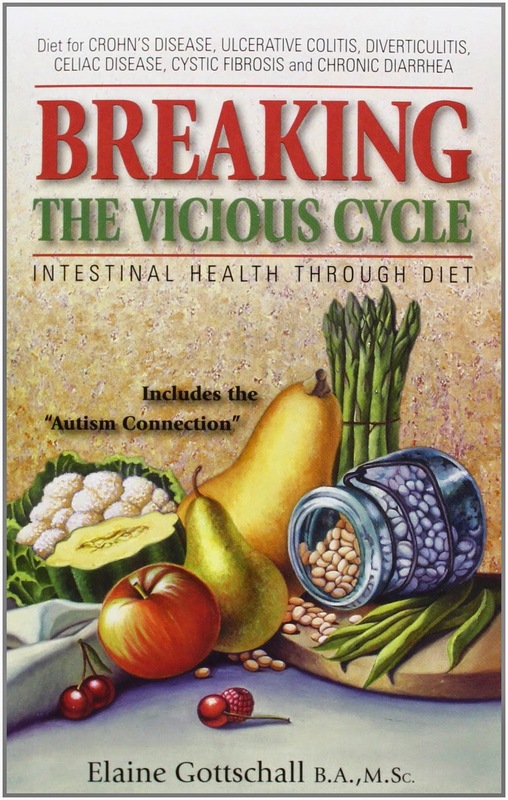 It has been many years of putting different types of foods into my body, that I know what works and what doesn't work. And, I admit I am always learning new things about my body as well as understanding that some foods I ate awhile ago don't work now, and some foods I avoided do work now. It's a tossed salad. I read this verse lately -- and was encouraged by it. 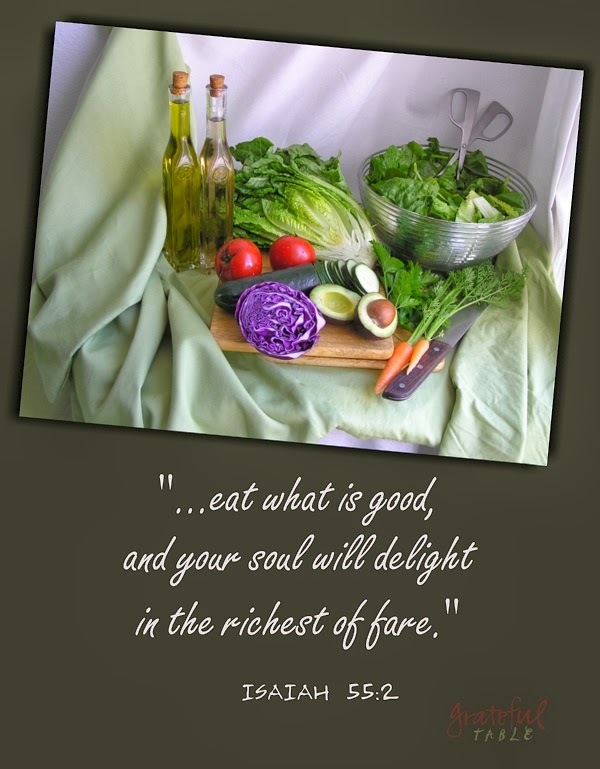 "...eat what is good, and your soul will delight in the richest of fare." I am being reminded that my hunger and thirst are first satisfied from the Lord. That is to say, I need to find my strength and nourishment from HIM first to help me through eating the best things for my body. And, it also applies (at least to me it does) that if I eat food that is good for me, I will feel better and will be able to delight in the good food that God provides for me and serve HIM better. I can not only feel better, but have more energy and clear mind to be with my family and do more things with them. Enjoy them! 1. Grains/Gluten -- rice, barley, wheat, corn, oats, rye, etc. 4. Natural sweetners - honey, maple syrup, etc. There you have it! For the next 60 days I am challenging myself to follow those as my guidelines. I make my menu around those. Here is the kicker, though. I have 2 vegetarians in my household (one of them being my husband). So, I have to really be creative in menu planning - because I don't want to make completely two separate meals every day at dinner time. That is a challenge as well. Okay. That is all you get for now. I will maybe share some websites next time that I find very valuable. And if you suggestions -- please share! I do appreciate your support and prayers. I will be honest, it is hard for me to be disciplined and diligent. I think that is why I choose to blog and facebook about it. I need that accountability. What do I mean by this "GO-TO meal"? Why have these "GO-TO" meals? Answer - what I have discovered when meal planning and trying to save a little bit of money in the bank account, is to have ingredients for these type of meals for days that you find yourself without much time, in a rut, and in need of something simple and easy to make -- yet nourishing, healthy, and satisfying too! Because all too often, I find myself in a rush and then opt for the unhealthy version of a "meal" and pull into a drive through death trap restaurant or whip up a box of mac-n-cheese and hotdogs. Uh, yeah.... not a great life style to obtain or by any means healthy. Sometimes those kind of days happen and I am not going to beat myself up for it -- but, I don't want it to become a bad habit. Trust me, I have had this bad habit. I am placing them on the fridge - so, that I can visually see it, and not have to rack my brain as to what to make that night in a rush. I can go to the list, pick a meal and make it. Now, the trick in my meal planning and grocery shopping is to make sure that I have all those ingredients on hand -- if I use it up that week, I put them on my grocery list for shopping next week. I may not use any of the "GO-TO" meals that week. But, the ingredients are there when I need it. Here are a few of the "GO-TO" meals for our family. VEG GREEK CHILI -- 1-2 cans each of Garbanzo bean, artichoke hearts, sliced black olive, diced tomatoes -- italian seasonings. Put it all in pot or crock and cook until heated through and seasonings marinated. 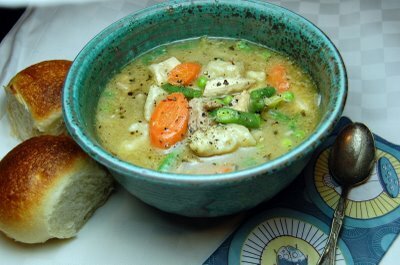 Serve with bisquits or bread. PASTA - Any type of Gluten Free pasta - SAUCE: olive oil, garlic, red pepper flakes or lemon pepper. CEREAL -- Okay, I just wanted to throw that in... ya know. ... there are some days when all I can muster up to do is Cereal. Unfortunatley, my kids are NOT big fans of Cereal and rarely does this happen. They would rather find some bread, toast. bagels. Ha ha ha. SO, that is probably not really one of my "GO-TO" Meals. Those are just a few. Do you have any GO-TO meals that your family enjoys? I always love simple, healthy meals. "All the shorts that they are selling now in the stores are WAY too long." Feel free to add your own in the comments.... what will you never say? FROM THE VAULT -- Let's Talk. So, here is a video of my sweet Lydia (now 8 years old)... who was about 3 years old when this video was taken. Oh, my dear sweet Lydia. All she wanted to do was just talk. What is funny is that my now 3 year old daughter Audria looks and sounds and acts so much like her. It is so much fun to see the similarities. After watching this, it makes me get a little teary eyed. Sweet girl. I need to capture more videos of my girls, because it is just a thrill to go back and see them.